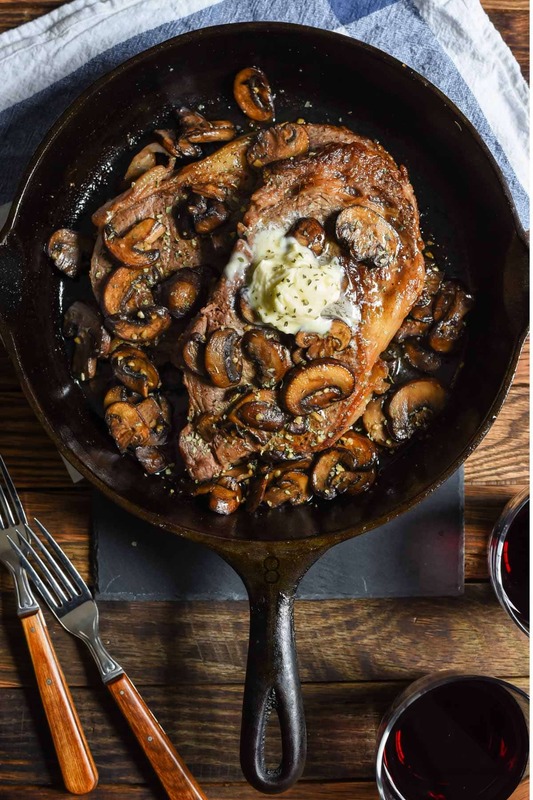 Once you make steak in a cast iron skillet you’ll never go back! 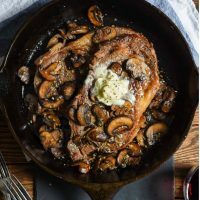 This Cast Iron Ribeye with Garlic Mushrooms takes about 20 minutes to make but is worthy of any special occasion. It wasn’t until I was newly married and on one of my first vacations with the Mr. that I began to appreciate steak. I don’t know if it was the elegant atmosphere or the salty sea air, but on a whim I ordered the filet mignon. And everything changed. This steak was juicy and so tender it almost melted in my mouth. From then on, I was a steak girl, or, rather, I was a filet mignon girl. I decided that was the steak I liked and I was loyal to it like a kid is loyal to their favorite ice cream flavor. I eventually began branching out, trying new cuts of steak and even making them at home. I discovered leaner cuts make fabulous sandwiches and tacos, like these Grilled Flank Steak Sandwiches with Caramelized Onions or these Flank Steak Tacos. When we purchased a side of beef a few years ago, I tried all the different cuts–sirloins and T-bones, my beloved filet and skirt steaks. Out of everything we tried over those months, the ribeye’s marbly slab of intense flavor was what finally won my heart. The ribeye has become my favorite steak to cook at home. I like to keep things really simple since this cut of steak already has such great flavor. 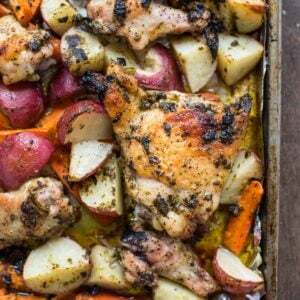 A hefty sprinkling of Kosher salt and fresh ground pepper is all it needs before it’s placed into a sizzling hot cast iron skillet and finished off in the oven. I discovered the cast iron sear/oven bake method for steak a few years ago, and it’s the only way I cook it now. The steaks are always perfectly browned with a tender, juicy center. I use a Thermapen to check the temperature and make sure I get just the right amount of pink. I aim for medium, no more, which is right about 145 degrees. 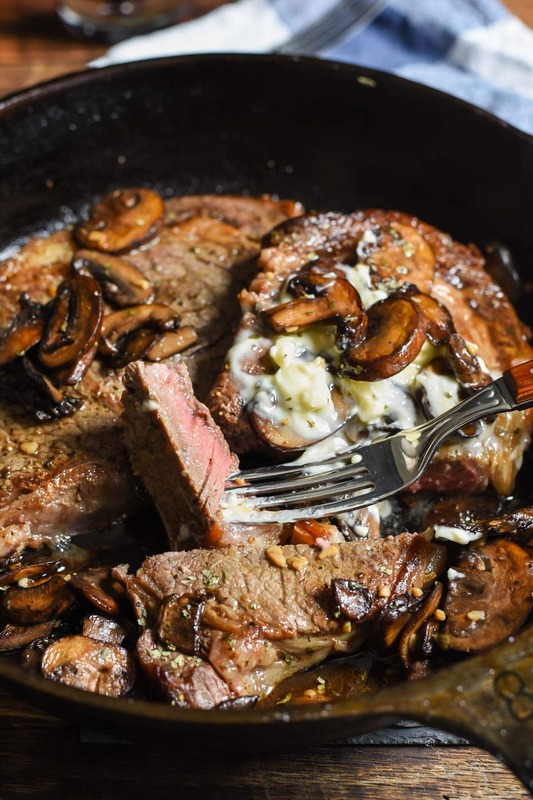 Of course, steak this good really doesn’t need much dressing up, but because Valentine’s Day is coming up, I decided to smother it in buttery garlic mushrooms, which are a weakness for both me and the Mr. This combo is, unsurprisingly, phenomenal. I’ll admit, I was pulling off some of the crispy edges of the steak and sneaking mushrooms before I even took pictures. I have no will power when it comes to salty crispy meat niblins. What can I say? I’m a carnivore for life. There’s more than one reason to include beef in your Valentine’s Day plans. Aside from it’s tantalizing taste, a 3 ounce portion of beef also provides 25 grams of protein and 10 essential nutrients, including iron. Of course, every great steak dinner also deserves a great wine to go with it. If you’re unsure where to start, I recommend reaching for a Cabernet Savignon, which is bold and full enough to stand up to the rich flavor of the steak. 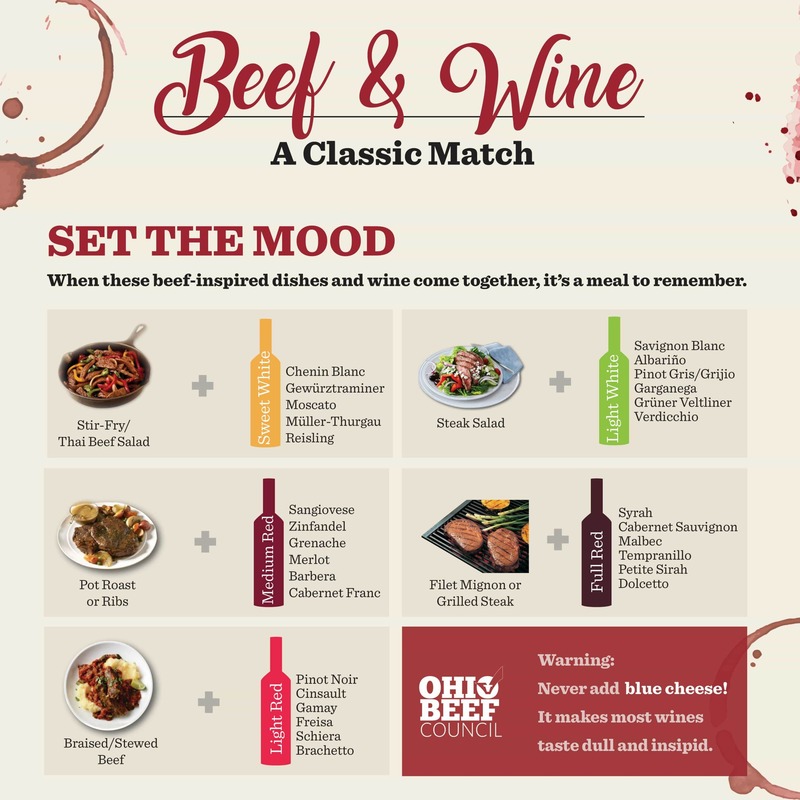 If you’re looking to branch out and try something new, check out the infographic below to learn how to pair your favorite beef dishes with wine. If you happen to have leftover ribeye (and that’s a BIG if! ), I highly recommend using it for this Ribeye Steak Salad. It is incredible! For more beef recipes and ideas, check out Ohio Beef on Facebook, Twitter, and Instagram, for more cozy winter meal ideas. 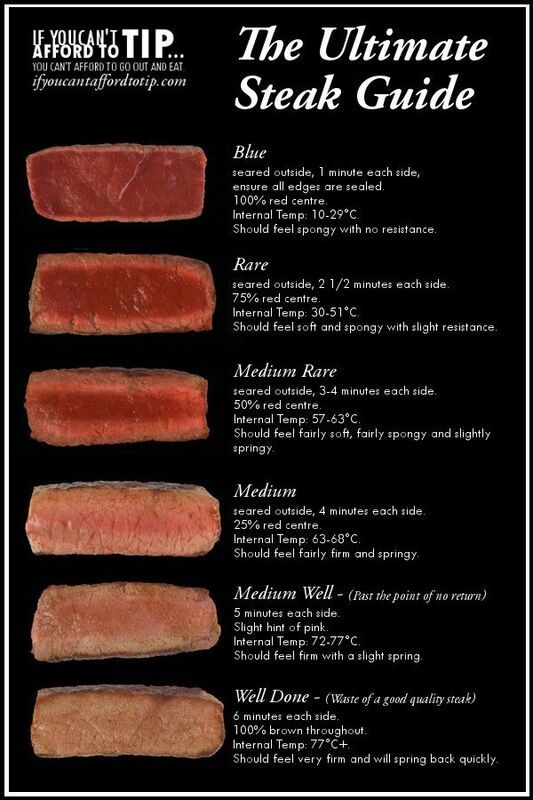 Remove the steak from the packaging and allow it to rest at room temperature while the oven preheats. Brush both sides of the steak with vegetable oil and sprinkle generously with salt and pepper. Place a cast iron skillet over medium high heat and coat with about a Tablespoon of vegetable oil. Heat the pan until the oil is shimmering and droplets of water sizzle in the pan. Add the steaks to the pan and allow them to cook until seared on one side, about 3-4 minutes. Flip the steaks over and then place in the oven to continue cooking until the internal temperature reaches 145 degrees for medium, or about another 4-6 minutes. Remove the steaks from the oven, transfer to a plate (preferably a warm plate!) and place a Tablespoon of butter on each steak. Tent with foil and allow to rest for at least 10 minutes. Meanwhile, make the mushrooms. Melt 2 Tablespoons of the butter in a large skillet over medium heat. Add the mushrooms and allow them to cook undisturbed until well browned on one side. Flip them over and continue to saute until the mushrooms are soft and browned. Stir in the garlic and cook for another minute, or until fragrant. 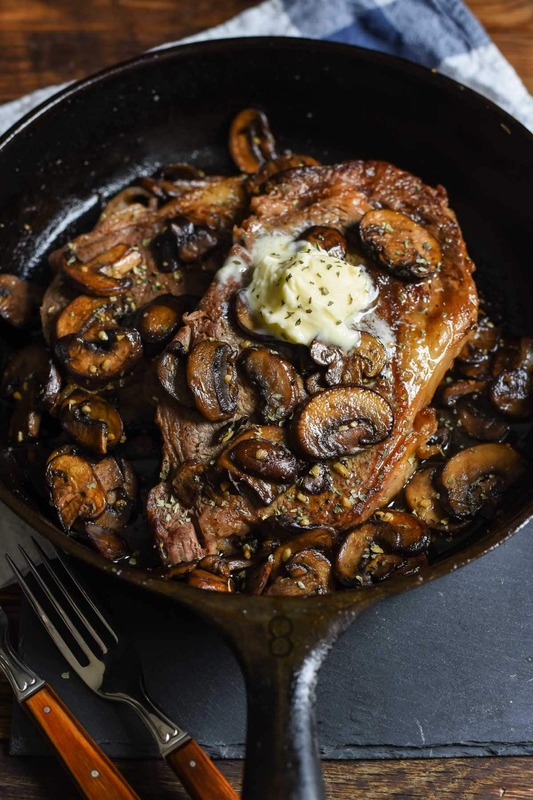 Serve the steaks with the mushrooms on top. This post was developed in partnership with Ohio Beef. As always, all opinions are my own. Thank you for supporting the wonderful businesses who keep NeighborFood afloat. There are also Amazon affiliate links in this post. If you click on a link and make a purchase, a small percentage will come back to NeighborFood. omg this steak looks perfect and like the best Valentine’s Day meal ever!! I was the same way about steak when I was a kid, but now i love it 🙂 I also LOVE my Thermapen!! Thanks so much! I used to think using a thermometer was so fussy, but now I realize it actually makes my life SO much easier! Do you tent them in the hot skillet when you take steak out of the oven? No, I remove them to a plate and tent them there. I’ll specify that in the recipe! Can I just place the plate with steaks in the microwave while I continie with the mushrooms? Yum!! 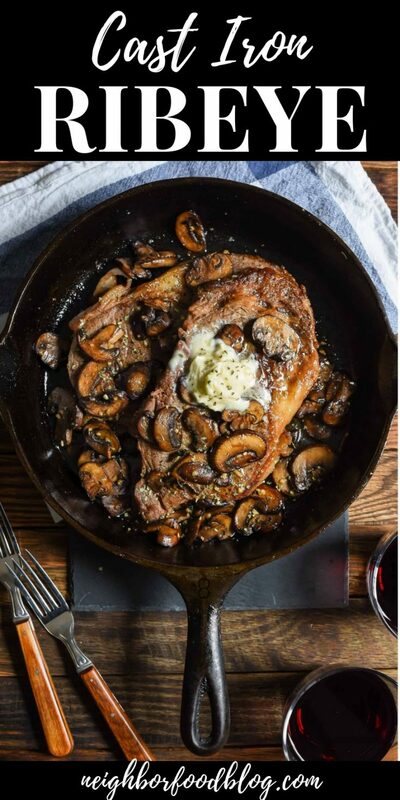 This steak w/mushrooms looks absolutely heavenly! This looks absolutely delicious! Great photos as well! 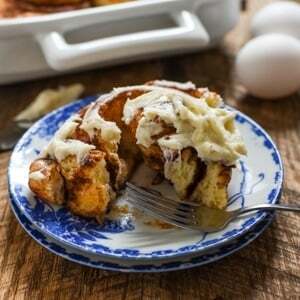 Will try this out but I think I may sprinkle some blue cheese on top! Sounds lovely! Thanks for commenting! Oh heck yes!! This is my dream meal, right here. Haha! Whoops! Thanks for catching that! You must honor the mushrooms for their sacrifice. im trying this tomorrow!!! i bought all the ingredients but i dont have a thermometer… how can i know when the steack is done?? Great recipe! I added some left over port wine to the mushrooms at the end. Yum! That sounds fabulous. So glad you enjoyed the recipe!